A pack of 8, 10 or 12 A5 personalised children's Pirate party themed invitations. Each invitation with it's own blue envelope. 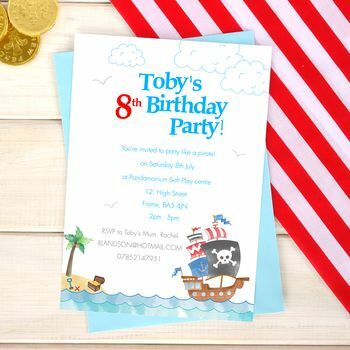 Perfect for budding pirates on their pirate themed birthday party, these single sided invitations are an unique and fun way of asking friends, family and of course the kid's from school to attend your child's birthday party. Choose which pack amount best suits your event, fill out the required fields and we'll do the rest! Simply fill in the form and let us know the details of your child's birthday party and we'll do the rest! Choose the material for your invitations to be printed on from paper or 200gsm smooth card. Each of these invitations are printed to order and each invitation will come with it's own envelope. This product is dispatched to you by Chi Chi Moi.